So there's always a reason for cake! 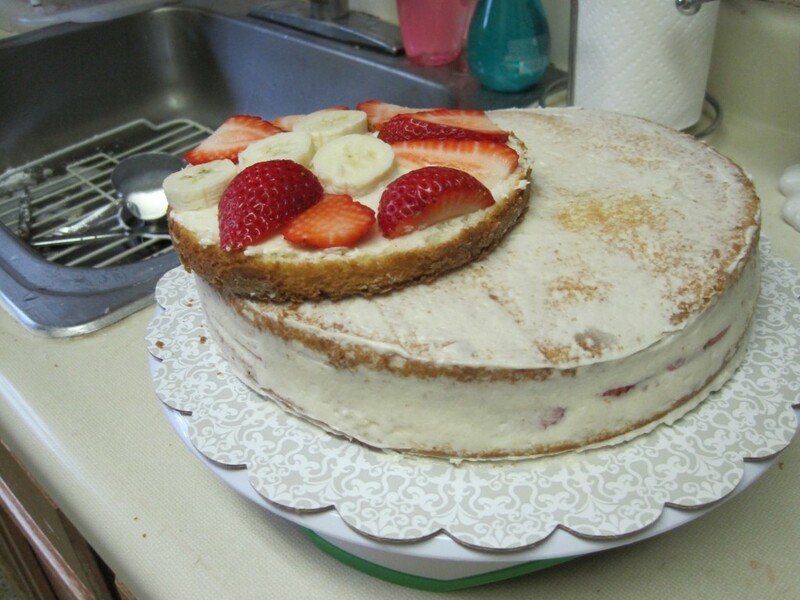 Since this was a complicated cake, I took a lot of intermediate pictures. I figured I would share the process. 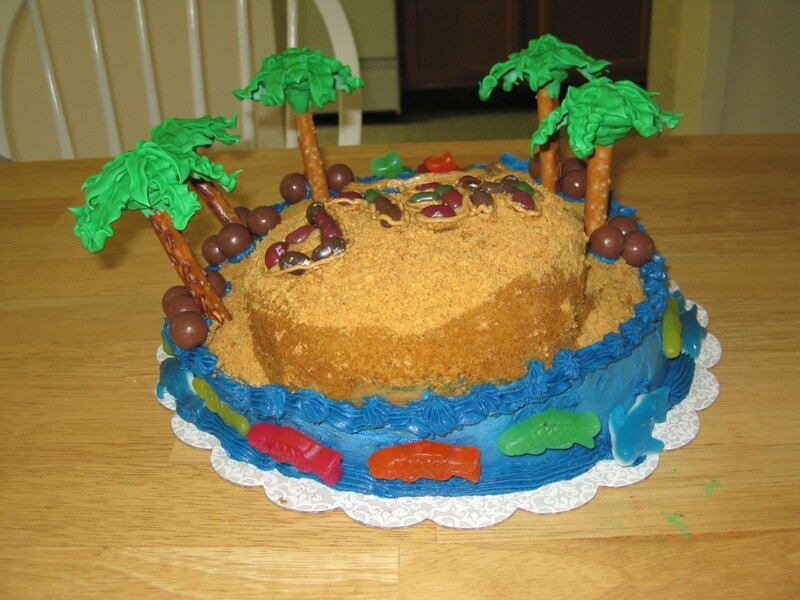 The first thing I did was start on the palm trees several days before making the cake. 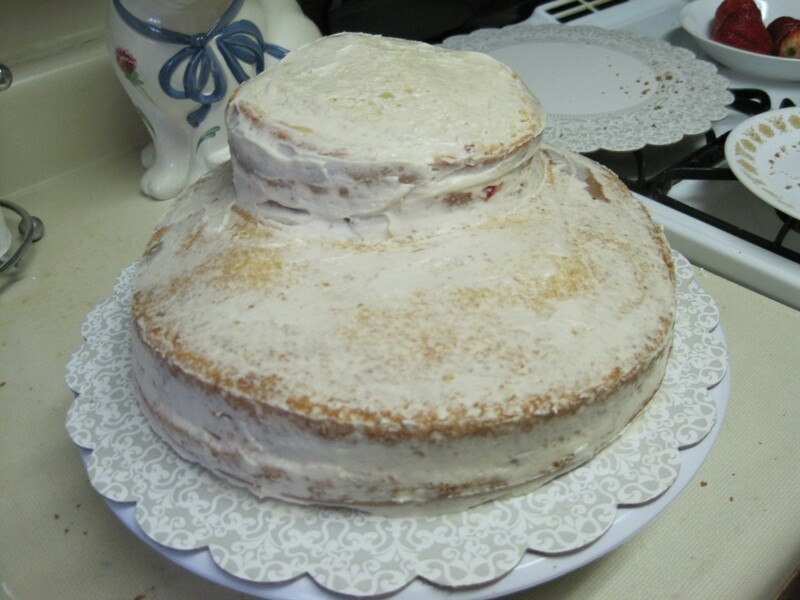 I can’t take credit for the idea…I modified this tutorial from bakedecoratecelebrate.com. Basically, to make the leaves curved, you have to make them on a curved surface. I taped wax paper onto several of those squeezy balls for used wrist strength. You know, the kind that have company logos that you take at conferences. I have a ton, so this worked well. Next, I made green royal icing and piped several interconnected leaves onto the wax paper using a #366 tip. I started at the center and radiated outward, making sure all the leaves touched at the center. I actually did two layers of leaves for added strength, but I did the second layer a day later after the bottom layer had dried. Once everything was dry, I carefully took it off the wax paper and flipped over. 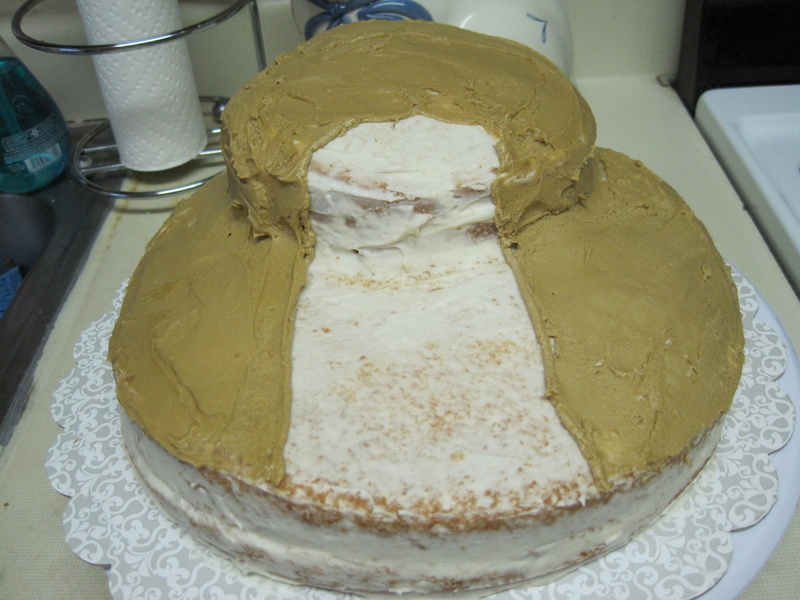 I added a mound of green royal icing to the underside with a #12 tip, and added a pretzel rod for the tree trunk. I let that dry another day, and then the palm trees were ready. 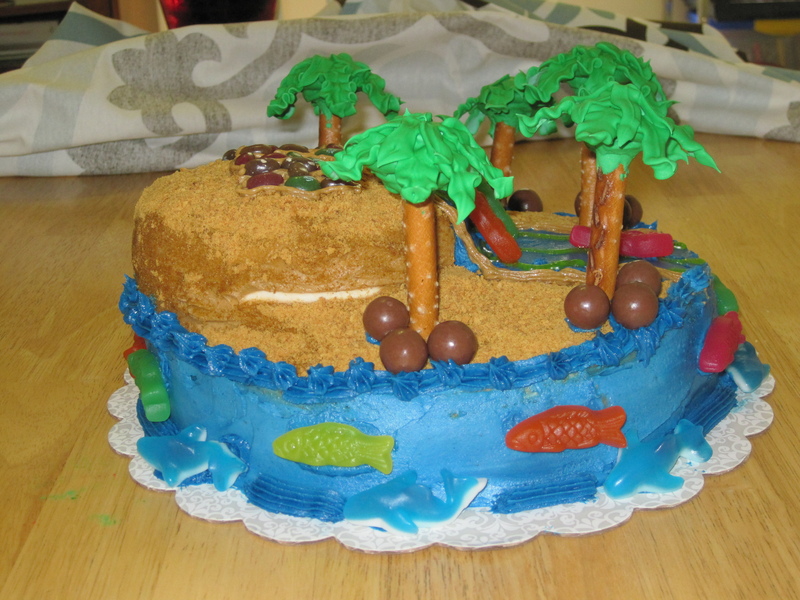 Next I made the beach with tan icing (add just a little brown to white buttercream) and graham cracker crumbs. And of course a LOST beach would not be complete without a jellybean help sign that could be seen by airplanes flying by. 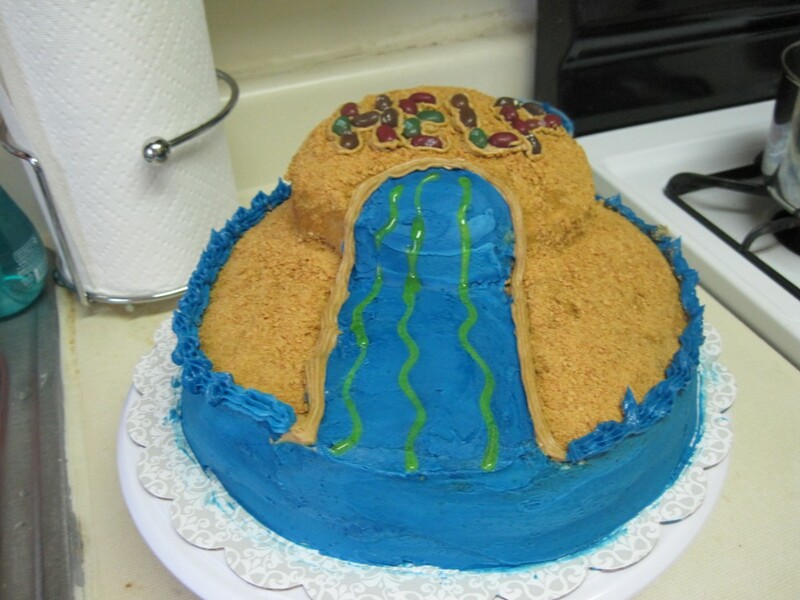 Next came the water, which was done with deep blue icing. 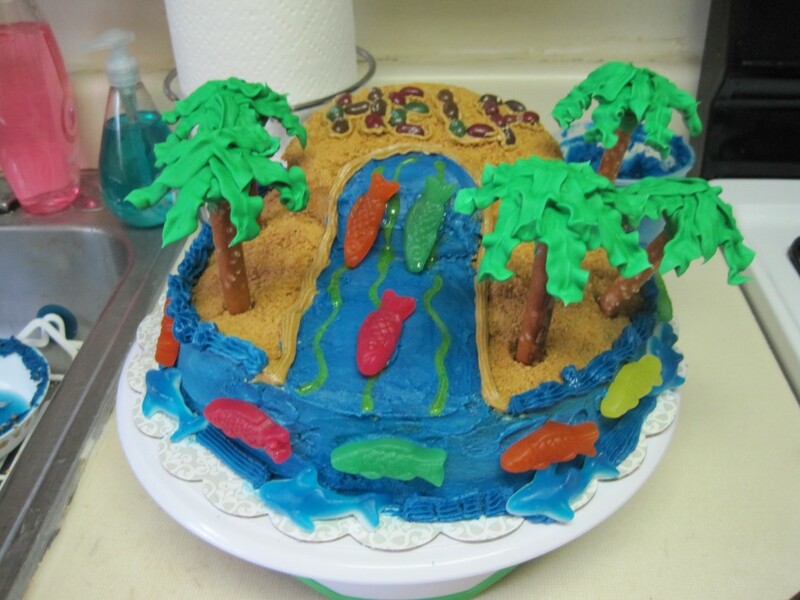 I had leftover yellow piping gel from my Wilton class, so I used that to make some waves on the waterfall. 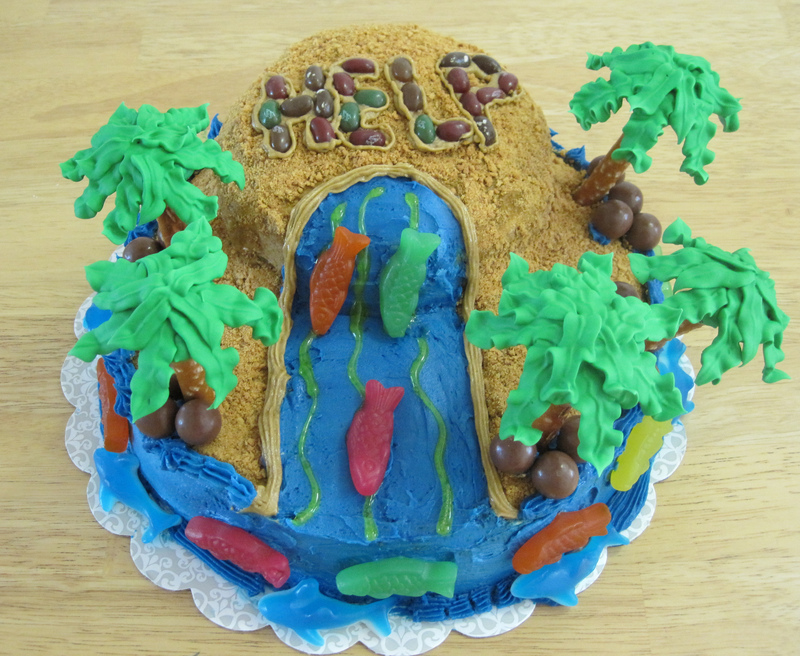 Then I added Swedish fish, gummy sharks, palm trees, and coconuts (malt balls). 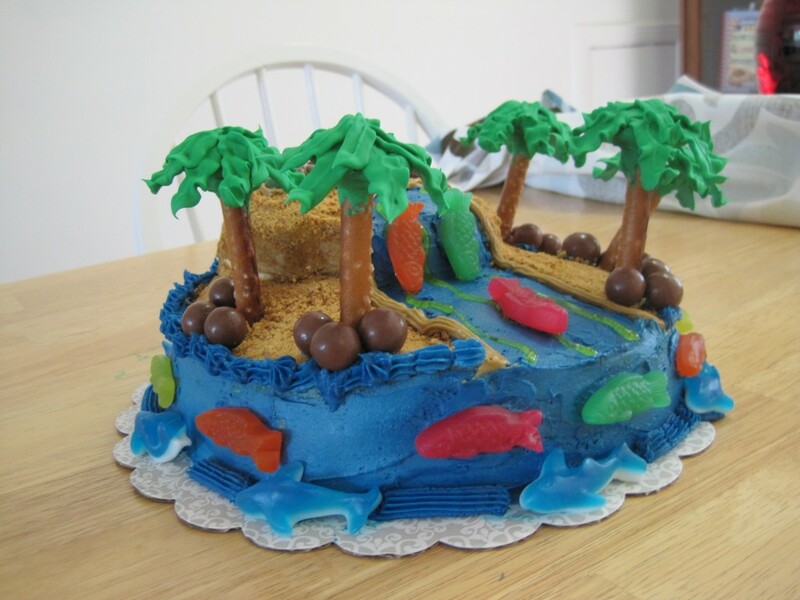 What I like most about this cake is that it is meant to be viewed at every angle, and every angle is a unique view of the island. So here are some alternate views to get a sense of the island in 3D. 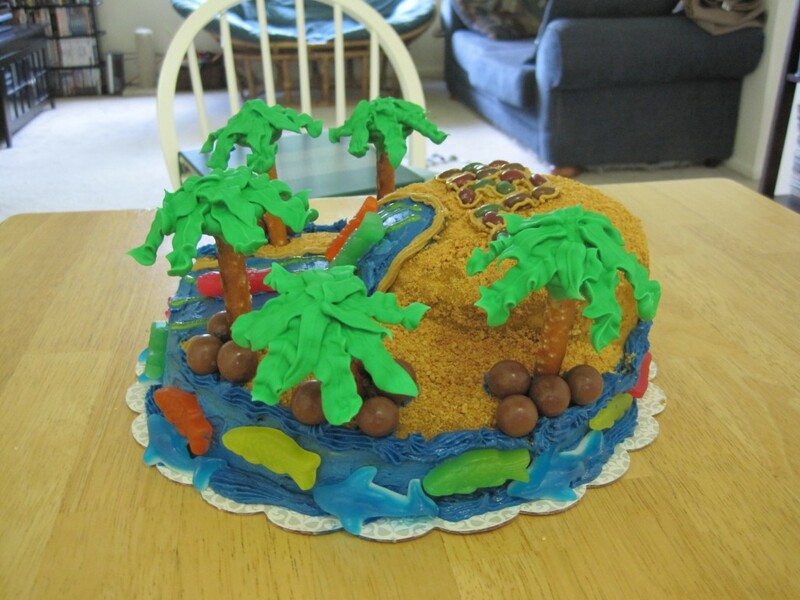 This cake definitely made a splash at the LOST finale with my friends. Plus, with the candy and different textures it was not only visually interesting, but it was also interesting to eat! 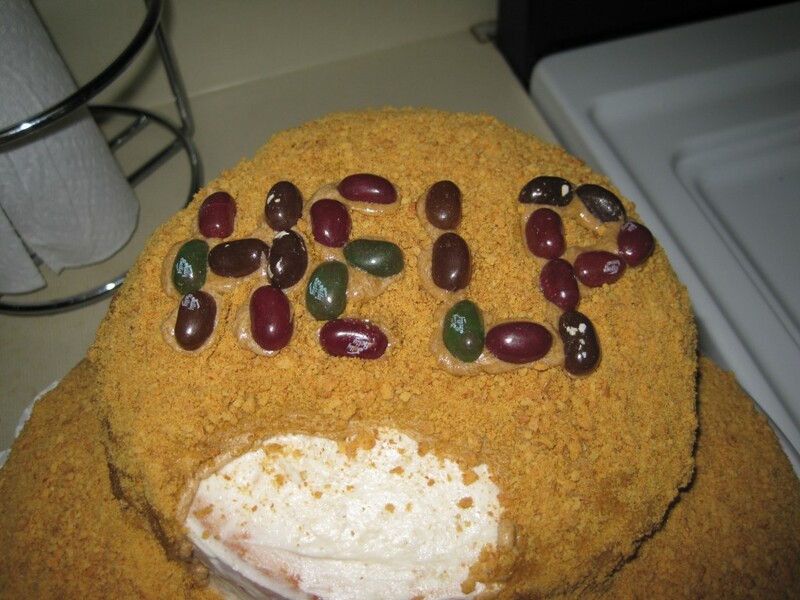 This entry was posted in Cakes. Bookmark the permalink. 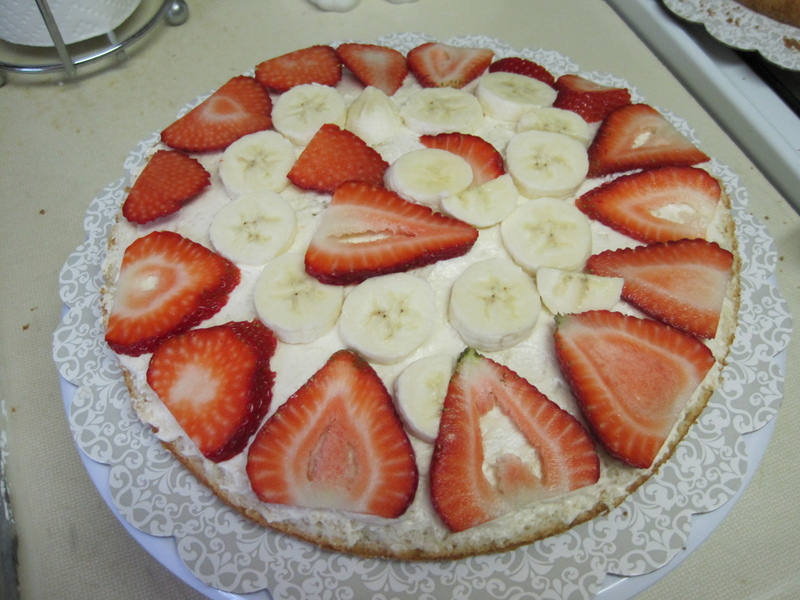 This cake was awesome AND it tasted terrific! One of my favs! It definitely was an awesome cake! 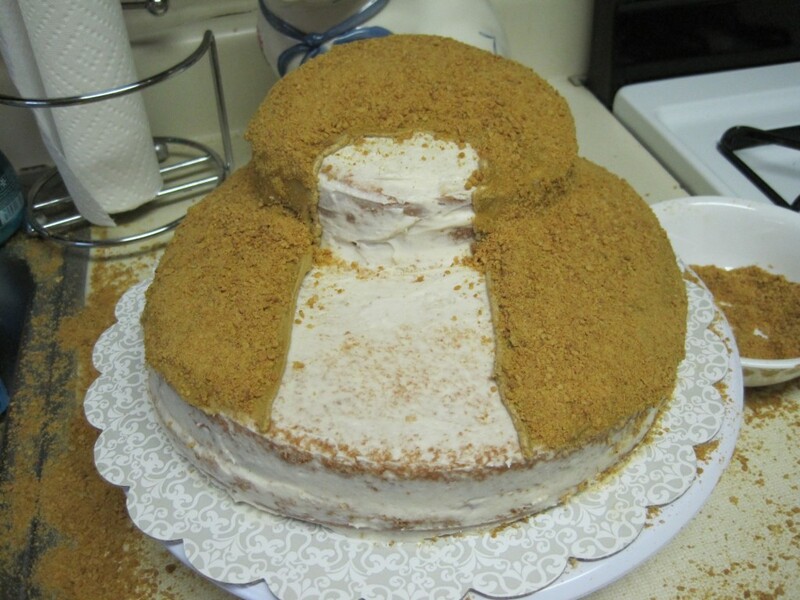 Nice job on showing all the different stages for decorating it.